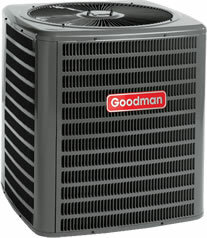 B&G Heating and Air is a proud supplier of Goodman brand commercial and residential HVAC equipment. The founder of the company, Harold V. Goodman, started as an HVAC contractor in 1954. His business located in Houston, Texas was one of the most successful HVAC contractor businesses in the country. He entered the manufacturing field in 1975, making products for equipment. He was able to expand to manufacturing the kind of HVAC equipment he wanted on the market when another manufacturing company was shutting down. He purchased all their manufacturing equipment in 1982, which was the start of Goodman Air Conditioning & Heating as an HVAC equipment manufacturer. Goodman makes high quality products with a low cost that are made to be long lasting. Goodman boasts having some of the lowest rates of failure and best limited warranties in the industry. Our company has a full inventory of Goodman commercial and residential AC units and equipment ready for sale and installation. Our certified technicians are well-versed with the Goodman brand air conditioning and heating line, they will install, repair, and service your Goodman AC units. In combination with Goodman, B&G Heating and Air is dedicated to providing our commercial and residential customers alike with the very best AC units and quality service. Whether it's for a business or a home, we want to ensure you have superior equipment and the proper heating and cooling your establishment or home needs. As a service provider for Goodman, we uphold their standards of quality and values. We are proud to install and repair Goodman HVAC systems because we know it is the among the best in the industry. B&G Heating and Air strives to be the best installation, and repair service in Jacksonville, FL. We will make sure your air conditioning unit is well serviced so you can stay cool in the summer and warm in the winter.